Part of our responsibility as providers of food products is to provide you with an understanding of the process involved in providing quality products for your patients. 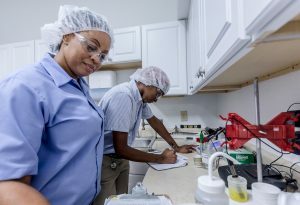 To adequately evaluate the nutritional configuration of a particular product by testing, samples of the product must be taken at various points during a production run. There will be minor variations in any manufacturing process. FDA standards permit an â€œacceptable +/- variationâ€ and the goal is always to produce a product that conforms as closely as possible to the labeled nutritional facts. Additionally there will be variability in laboratory testing methods. Each laboratory tests fats, protein and carbohydrates differently. For example, carbohydrate levels are a calculated result rather than actual test result at some laboratories. Additionally, certain raw materials including agricultural products like soy are provided in a range of values by processors to allow for seasonal differences and the seasonal variations are not required to be reflected on the nutritional panel. We have included complete tests of our products conducted by an independent laboratory for your review. Most practitioners focus on the protein content of the supplements they provide to their patients, so do we. What we claim on our packaging, we back up with testing.